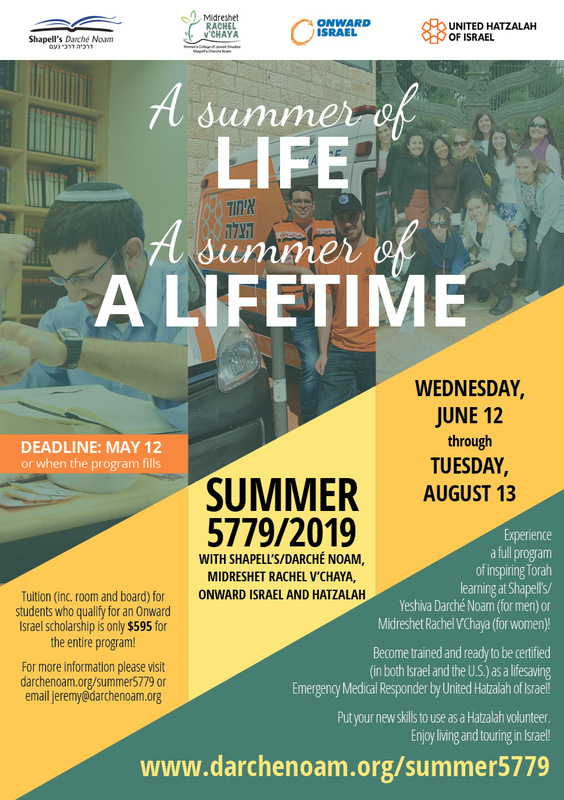 Shapell’s/Yeshiva Darche Noam and Midreshet Rachel v’Chaya are excited to announce their upcoming, “Summer of Life- Summer of a Lifetime!” Students will participate in our regular program of Torah learning and inspiring trips- as well as being trained as Emergency Medical Responders by United Hatzalah of Israel. After being trained and ready for certification, students will have the opportunity to put their skills to use as Hatzalah volunteers. Students who are eligible for Onward Israel scholarships, will enjoy this nine week program for only $595 (including room and board). Last summer was the best summer of my life! To live and learn in Israel while growing as a person and helping others was an experience I will cherish forever and has shaped my life since. I learned so much more about myself and what I want while also learning how to dig into Gemara and how to save lives. It was an incredible experience I won't soon forget! I loved the Hatzalah course with Onward Israel and Darche Noam. It was interesting, fun, and rewarding. The ambulance shifts were amazing, and at the end you can be certified emergency medical responders. Anyone who wants a summer of learning Torah, and a fun way to make a difference, should consider this (especially if you are planning on going into a medical field). Hatzalah Emergency Medical Responder training will include 60 Hours including class and field training hours. Towards the end of the course, students who have met all requirements will have the opportunity to volunteer on United Hatzalah ambulances. Students will be well prepared to complete the necessary tests to receive United Hatzalah EMR Certification, National Registry of the United States EMR Certification, PHTLS, and the American Heart Association Certification. For more information click here! If you have any further questions contact Rabbi Jeremy Block, Director of Recruitment, jeremy@darchenoam.org.